While you may be looking ahead to your summer holidays in far-flung exotic locations, London’s food scene is hotting up with a ton of new openings which showcase the best from cuisines around the world. Italian, Hawaiian, Singaporean; London Calling shines a light on these new eateries which will take your taste buds on a summer holiday of their own. Just in time for summer, a new street food market is opening in an exceptionally preserved Edwardian underground station in Fulham. Market Hall Fulham has 10 traders, serving up delicious and Insta-worthy food, such as colourful cones from ice cream artists, Soft Serve Society (try their unusual liquorice or black sesame options) and fresh, flavourful bowls of goodness from Ahi Poke; bringing the sunshine of South California to SW6 with their combinations of salmon, smashed yuzu avocado and kimchee cucumber. 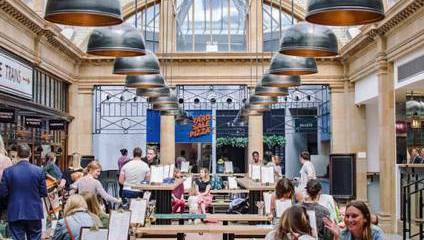 Alongside juicy kebabs, stonebaked pizzas and fluffy doughnuts, Market Hall will have a fully licensed bar serving up craft beers, wines and cocktails, ensuring there is something for every one of your picky friends. With seating for 200, we reckon this place will be a summer hotspot. If you can’t get enough of street food festivals, don’t worry, as Paddington will also be opening a new collection called Huckster at the end of May. Alongside street food favourites such as True Burgers, Mofo Chicken and Wonton Willy serving mouthwatering burgers, succulent chicken and nourishing Wonton soup respectively, Huckster also is home to a karaoke bar so you can belt out your favourite Whitney classic before ending the night with a sumptuous waffle from Bubble Gods. And there will be plenty of booze on offer to build up that belting courage; world class international bartenders have created a special NYC inspired menu, filled with fresh fruit and herb flavourings. Good cooking obviously runs in the family when it comes to the founders of this new plant-based food studio restaurant which has just opened in Hoxton. Kirk and Keeley Haworth happen to be the offspring of renowned Michelin starred chef Nigel Haworth, yet both have their own food credentials. Kirk has worked in restaurants across the globe while Keeley has roots firmly based in food nutrition; together they have created Plates which brings style, substance and creativity to plant based food, showing that healthy, natural food needn’t be boring. Their stylish dishes sound unbelievably tasty, such as the English Pea and Mint Dashi with sea vegetables and spring leaves, or their Pot Roast Hipsi cabbage with crispy potato, butterbean and truffle. As well as creating art in the kitchen, Plates will also act as a gallery, showcasing artists and their work which can be purchased. With a modern and innovative approach to food and creating an exciting environment, this studio is only open to the public each Saturday night, so make sure you get booking! If you love Italian food, La Mia Mamma is the place for you this June. Located in Chelsea, La Mia Mamma will be residence to a rotation of Italian chefs, 20 mammas from 20 different regions, and every season one mamma will take to lovingly create a selection of great tasting regional dishes for three months at a time. With Italy providing such a variety of amazing ingredients and cuisines, this restaurant will be the best way to taste your way around the country in London. Lidia Romeo from Sicily is first up and will be serving classic Sicilian dishes such as Arancine, Pasta all Norma and Sicilian sausages. She will be acting as the host, so it will really feel like you are dining with an authentic Italian family. There will be the finest Italian wines as well as region inspired cocktails on the drinks menu. And if you like it once, you can return in 3 months time for a whole new Italian experience. To celebrate the launch, La Mia Mamma will start with a “Pay What You Want” week from the 15th-22nd June. If you have never tried one of Singapore’s famous curry puffs, head on down to Covent Garden to taste one from Singapore’s very best, Old Chang Kee. After opening in 1956 back in Singapore, Old Change Kee became a national treasure before coming to London where its pop up in Kentish Town became an overnight success, selling out in just 4 hours each day. The curry puff originated when Hainanese chefs cooking for the British during the colonial rule took the humble pasty and injected it with all their complex flavours and spices. However if a curry pasty doesn’t tickle your pickle, Old Chang Kee will also be serving bowls of steaming laksa, warming chicken curry and nibbles. This first permanent spot is a small one, so will very much feature a grab and go ethos.